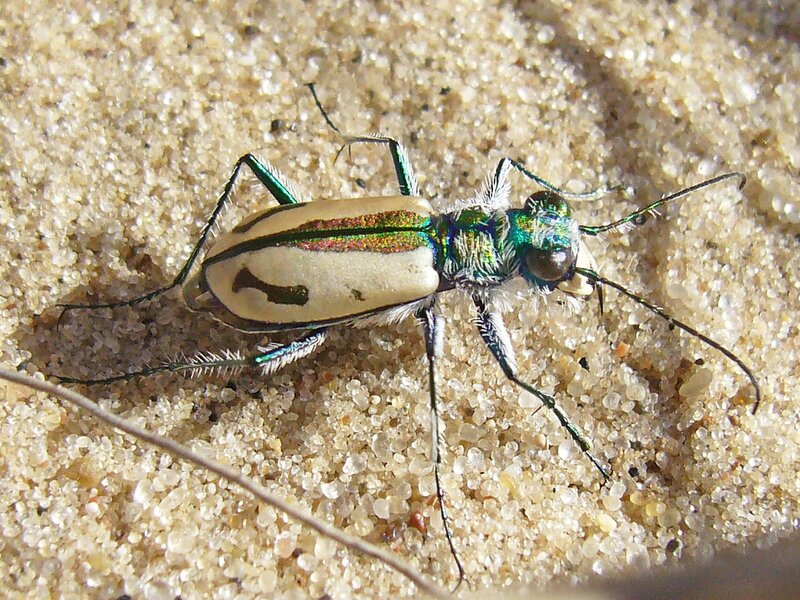 In my Lucky 13 post, I featured Cicindela limbata (sandy tiger beetle) from north of Grand Island, near the easternmost edge of the Nebraska Sandhills. This species is restricted to dry sand blow out and dune habitats away from water, thus its distribution in Nebraska largely coincides with that of the Sandhills themselves. Nebraska populations are assigned to the nominate subspecies, which is characterized by extensively developed white maculations on the elytra, with the sutural area and small discal markings metallic green or blue. The whitish areas on the elytra and dense pilosity on the undersurface, along with their habit of digging into the sand during the midday hours, are obvious adaptations for reflecting heat and avoiding the high temperatures that occur in their white sand habitats. In the more eastern areas of the Sandhills, the green sutural areas of the elytra are suffused with a reddish cast (see this photo in Lucky 13), while in populations further to the west no such reddish suffusion is seen. The individual featured in these two photos was found in the western Sandhills (near Hyannis) and is one of the individuals that I dug from their midday burrows (see Sand Hills Success). Had I not been clued into this behavior when I visited this site, I would have left with only the single individual that was seen at the surface. That individual was captured immediately, and further searching for active adults to take photographs of were unsuccessful – until I started digging, that is. Unfortunately, adults that have just been caught or dug out of their burrows aren’t the most cooperative photography subjects, so one of them was kept alive and placed in a terrarium upon my return to St. Louis. (These photos were taken about a week after I returned, and the individual lived for another seven weeks on a diet of 3rd instar fall armyworm and black cutworm larvae. I eventually trained it to grab larvae directly from the forceps – very entertaining indeed! Also, while these photos from the terrarium confines are adequate for illustrating the species, I think they still lack that undefinable spark that is caputured in true field photographs with unmanipulated individuals – compare to this photo). Cicindela limbata, with its five recognized subspecies1, has one of the more interesting distributions of North American species (see Pearson et al. 2006). In the main area of distribution, the southernmost populations, distributed through most of Nebraska and adjacent areas of Wyoming and South Dakota, are considered nominotypical. A distributional gap to the north separates these populations from subspecies nympha, which occurs in sand habitats of northern Montana and North Dakota and further northward into the Canadian Prairie Provinces. Individuals from these populations exhibit even greater development of the white maculations but darker intervening areas. Another distributional gap separates nympha from subspecies hyperborea, which (as its name suggests) occurs even further north in open sand habitats in the pine and poplar forests of northern Alberta and Saskatchewan and adjacent areas of the Northwest Territories. Subspecies hyperborea is characterized by its greatly reduced white maculations (thus, exhibiting expanded dark areas) and overall smaller size, both of which may be regarded as heat conservation adaptations for the far boreal climate in which it lives. 1 Excluding the federally endangered Cicindela albissima (Coral Pink Sand Dunes tiger beetle), which was recently elevated to species status based on mitochondrial DNA evidence (Morgan et al. 2000). The fragmented nature of the main limbata population in the upper Great Plains and into the boreal forests is, in itself, interesting enough. Even more interesting, however, are the existence of two small and highly disjunct populations far removed from the main limbata population. One of these is known from Labrador – almost 3,000 miles to the east! Originally referred to subspecies hyperborea, this population was theorized to possibly represent an accidental introduction since individuals appeared to be restricted to open sand habitats within 70 km of the Goose Bay airport (Larson 1986, Pearson et al. 2006). However, careful examination of individuals from this population revealed subspecific differences in maculation (intermediate between hyperborea and nominotypical limbata), lending support to the hypothesis that it is a naturally occurring population and resulting in its description as a distinct subspecies, labradorensis (Johnson 1990). Recent analysis of mitochondrial DNA sequences provided additional support for this subspecies as a distinct entity (Knisley et al. 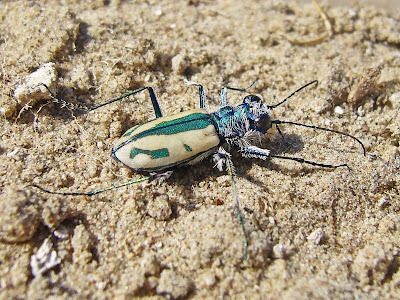 2008), and newly published field observations by tiger beetle afficionados Dave Brzoska and John Stamatov (2008) conducted 19 years after the initial discovery of the population suggest it is well established in suitable habitats much more distant from Goose Bay than originally reported. This accumulation of evidence seems to increasingly support a historical isolation rather than accidental introduction hypothesis. The fifth and final subspecies is an even more recently discovered and equally disjunct population in the Nogahabara Dunes of northwestern Alaska (Pearson et al. 2006). Although individuals from this population resemble subspecies nympha, morphological and mitochondrial DNA sequence analyses support its status as a distinct subspecies, designated nogahabarensis (Knisley et al. 2008). Such an unusual and fragmented distribution for Cicindela limbata and its subspecies is likely the result of historical changes in climate that have caused expansions and contractions of open sand habitats due to fluctuations in available moisture. The current geographical subspecies may have originated at the end of the mid-Holocene hypsithermal (or Holocene Climatic Optimum) some 5,000 years ago, when previously expansive open sand habitats would have begun shrinking and fragmenting as a result of declining temperatures and increasing moisture regimes. Brzoska, D. W. and J. Stamatov. 2008. A trip to Goose Bay, Labrador, Canada. Cicindela 40(3):47-52. Wonderful write up and wonderful photos again! The second photo is particularly striking. Great post. When you said you had it eating out of the forceps I couldn’t help picturing those cartoons with the trained fleas jumping through hoops and such. Maybe you should start a business on the side. Ted the traveling tiger beetle trainer. Doug – I have plenty of specimen processing and identifications to keep me busy while the tigers are asleep. I’ve already got grand plans for next summer. Huckleberry – those face-on shots are my favorites. I’ve got another one of formosa waiting in the wings that is a real stunner. cedrorum – watching it take worms directly from the forceps was a riot. I probably overfed it to death! ted, that face on shot of the tiger beetle is just amazing! Where do these beetles originate from? Nebraska or Africa?